Flying with a purpose.... to bring Help and Hope to those in need. Captain John along with his lovely wife Barbara will be flying (commercially) to New Orleans on Wednesday September 13th to attend his Bomb Group Reunion. 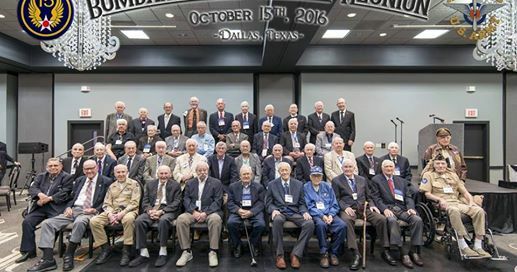 During WWII Captain John flew 14 Bombing Missions with the 484th Bomb Group (825th Squadron) and 39 OSS Covert Missions (HSSQ 885th) The following picture is of last years Reunion held in Dallas Texas……. Nevin, I cannot believe they had 40 vets at their last convention. Ten years ago we were lucky to have 10 or 15 at our 305th (8th AF) reunions so we “turned out the lights”. No more reunions. We do have a 305th Facebook page however. You and the Captain have not had any Angel flights lately. I miss your comments and pictures. John’s old group, the 484th Bomb Group will be lucky to have 8 or 9 veterans. But, we will have 8 bomb groups and maybe 35 veterans. Should be a great time seeing everyone again and visiting the WWII museum for two days. The Olson’s are looking forward to seeing you, John B. And Barbara!